Another year, another brick of a book, and the Pushcart Prize annual anthology marches on. If you live long enough, the literary stars you grew up with start to drop, driven, as Homer says, like leaves before the wind. Meanwhile, other worthy heirs will emerge as if from nowhere—or West Virginia, or some writing program in Alaska or even Iowa. 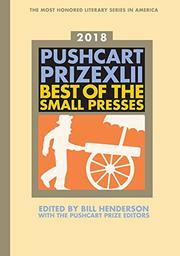 So it is with publisher (and himself estimable writer, as witness his 2000 memoir, Tower: Faith, Vertigo, and Amateur Construction) Henderson’s choice of nominated, vetted, adjudged, and now anthologized pieces from last year’s harvest of small press publications. In some instances, as with the late and lamented Brian Doyle, it is the writer who has passed (in Doyle’s case, leaving a lovely, impressionistic memory of Memorial Day parades gone by); in others, it is the subject, as with a profile by George Saunders—who has otherwise had a very good year—of the recently departed James Salter, or more precisely his sentences (“It’s a tiny move, a small improvement, but that level of care enacted over the course of an entire work is, for me, the essence of James Salter’s genius”—grasp that sentiment, and you can save an awful lot of money getting an MFA). The fiction writers and poets, alive and dead and perhaps somewhere in between, turn in the usual mixed lot; the already well-known Rachel Cusk delivers a little slice of hell with “Freedom,” a vignette in which a beauty salon becomes the locus of suburban mayhem, while the young poet Saeed Jones turns in an even more economical vignette, “Elegy with Grown Folks’ Music,” that shows just what can happen when the—yes, recently departed—singer Prince gets into one’s mom’s ear canal, if one’s mom is so inclined (“What is this nasty song and where did she learn / to dance like that”). Sometimes dazzling, sometimes so-so, every piece in the book is worth a look. Now in its fifth decade, Henderson’s Pushcart volumes are an invaluable record of what’s been happening in America’s more or less official literary culture. Hits, misses, and all, this entry is no exception.